Yamax Pedometers & Yamax are the original pedometer manufacturers and have been supplying high quality and accurate pedometers for well over a decade. The brand is most recognised for its Digi Walker SW Series; which is used in recommendation by the 10,000 Steps Organisation and many other Universities. Yamax Pedometers have been used in a variety of different studies and has been proven to have accuracy differences of +/-1% at any walking speed. They have also been tested against other models such as Omron, Oregon Scientific, Sportline & have come out on top. Yamax also has a broad selection of other Heavy Duty Pedometers (CW Range) & Accelerometers to choose from. The Accelerometers are a new edition to the range and use the latest in 3D Technology and piezoelectric sensors (meaning they count silently, can be put anywhere from your hand bag to pocket & count accurately!). 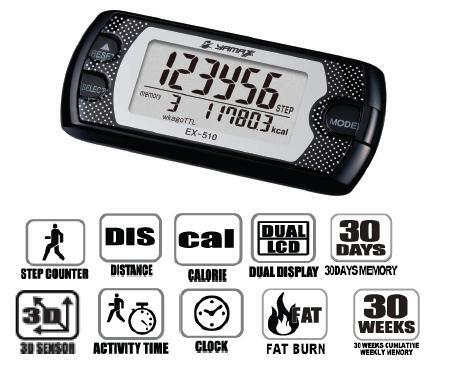 These Pedometers are great for health & fitness goals due to their long life expectancy, extreme accuracy & huge list of features including Calories, Memory, Fat Burnt, Distance, & Activity Time. Huge List of Features - Calories, Distance, Memory Ect.